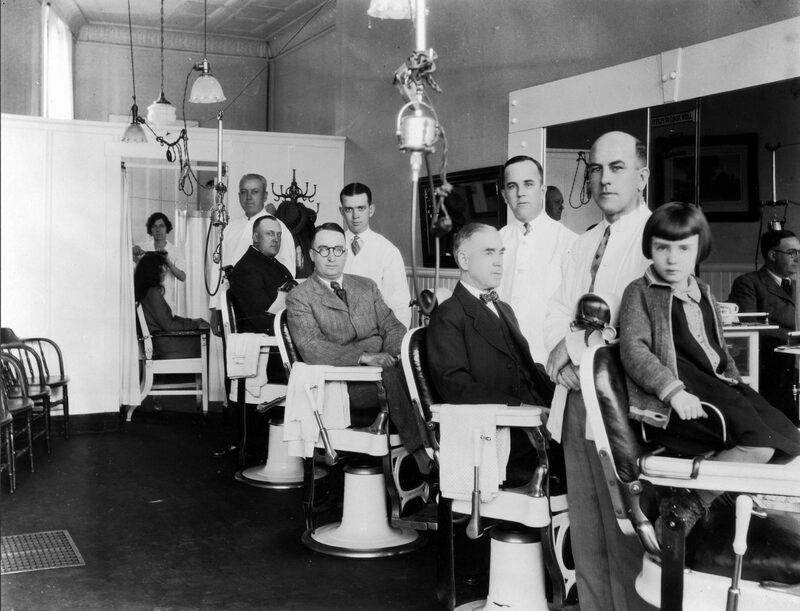 According to Wikipedia “The barber’s trade has a long history: razors have been found among relics of the Bronze Age (around 3500 BC) in Egypt. … In addition to haircutting, hairdressing, and shaving, barbers performed surgery, bloodletting and leeching, fire cupping, enemas, and the extraction of teeth; earning them the name “barber surgeons”. 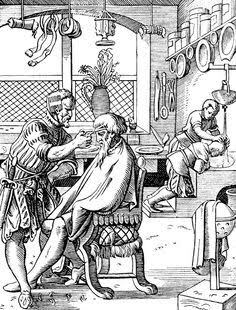 The ancient barbers in the drawing above seem to be engaged in basic barbering although Google Images contains many images of barbers plying their more sanguinary duties. 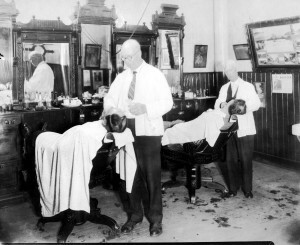 By the time barbershops began to appear in the St Croix Valley in the 1870’s, barbers had turned those unpleasant enemas and bloodletting over to doctors which, in those days, wasn’t much of an improvement for patients and upgraded the barbering profession to that of “Hair Dresser”. 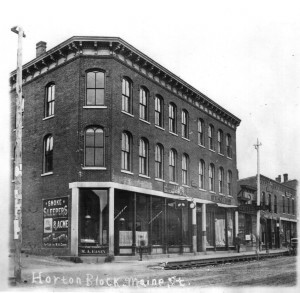 Mike Casey, which became Mike Casey and Sons, began business in the old Flatiron Block next to the St Croix Hotel about 1880 and around 1900 moved to the location across the street at the corner of Sawyer Avenue. Today Karen’s Pub is out of view just to the left across the alley but the cigar ad, which changed over the years, was repainted by Jake Chambers when he renovated the building. Many of us had our hair cut in this shop into the 1970’s. 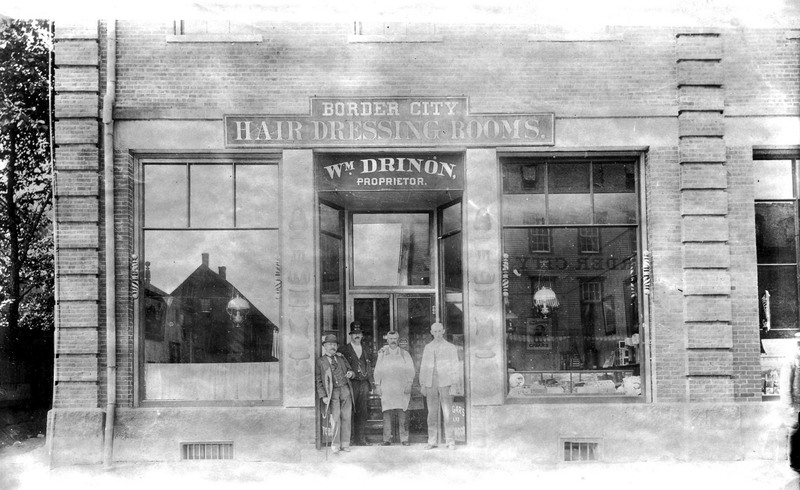 Ira Leighton was another well known hair dresser of the period who plied his trade in his shop on Church Street just up from the corner of Main and below the fire hall. 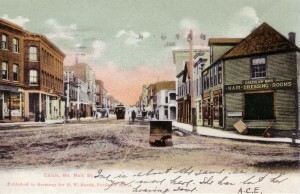 The fire bell can be seen above the roof of the shop and, as the City Building has not yet been built, this photo is before 1900. St.Stephen had as many barber as Calais at the turn of the century, the most well known being the Casey Brothers- Tom and Pat who barbered for 53 years in St. Stephen. 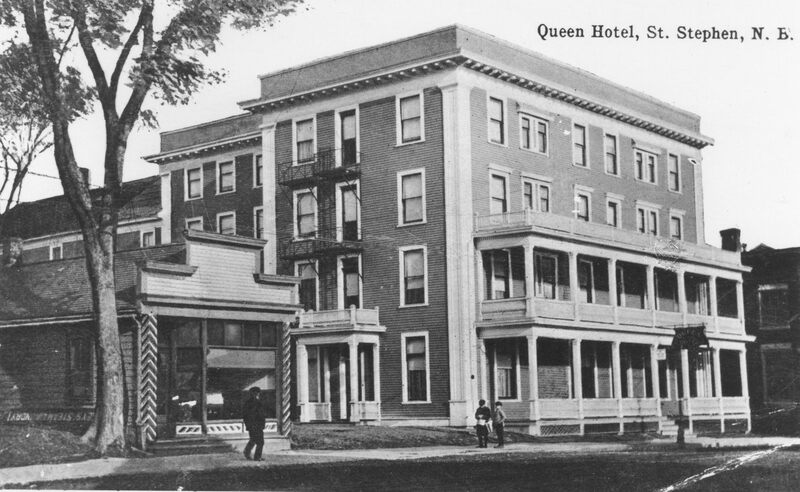 The photo above shows a barber shop on Main Street next to the Queen Hotel but we can’t say it was Tom and Pat’s who are shown in the second photo. How many Caseys were barbers in Calais and St. Stephen is hard to calculate but it must have been close to double figures. There was also Jim Casey’s Barbershop near the Boston Shoe Store for many years. Jim was the father of Mary and Frances Casey and may have been a St Stephen Casey. 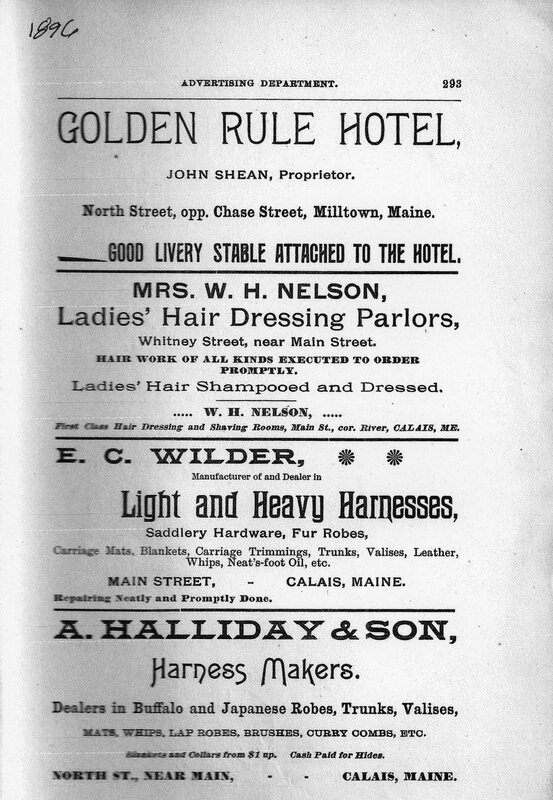 George Wilkins and Ed Whitney handled the barbering in Milltown Maine for several decades, Ed Whitney was barbering as early as 1885.. 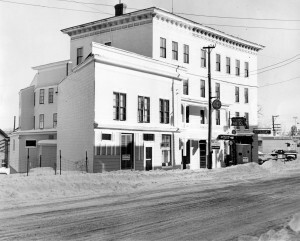 The shop moved from time to time but was once at the corner of Chapel Street in a building which became the Post Office. Later a fellow named Tom Cleary has a small shop in Milltown. 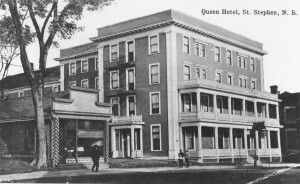 It was across Main Street from the bottom of King Street. 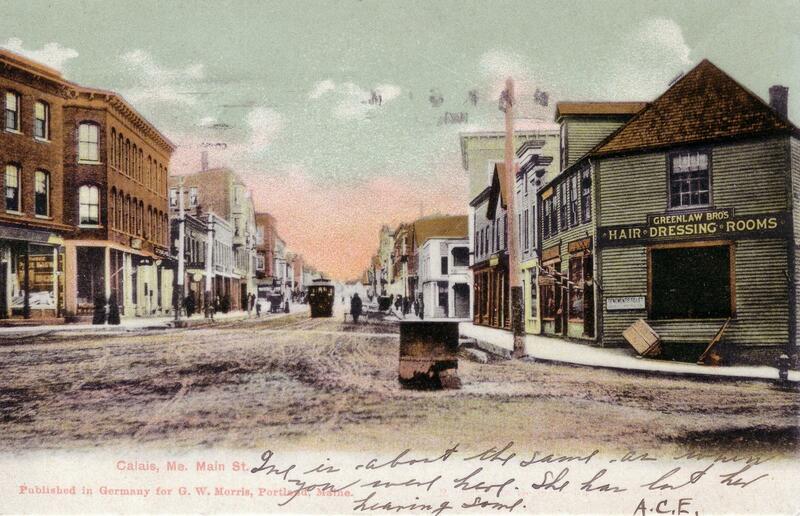 When it rained heavily the water would run down King Street, across Main and into Cleary’s barbershop. He would open the front and back doors, letting the water run through. 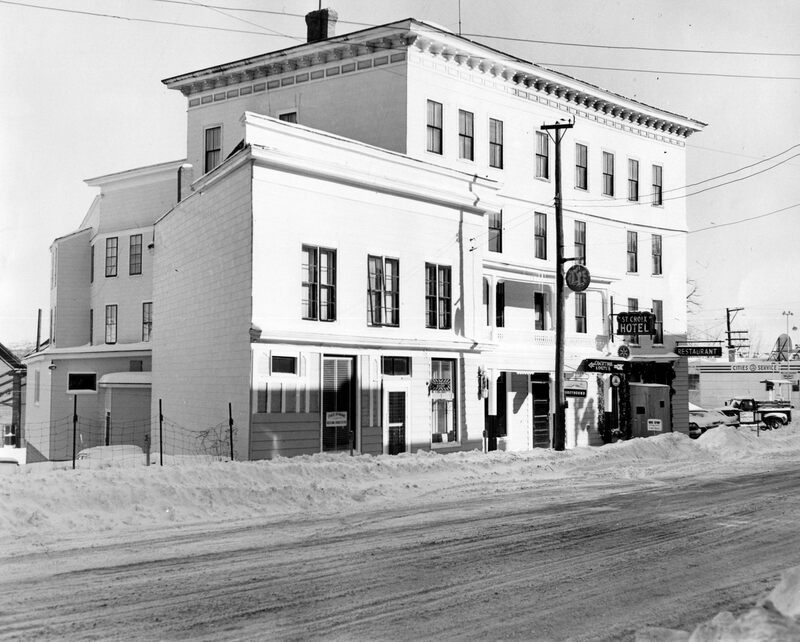 By 1935, when barbers were again called barbers in the local business directory, Calais had seven barbershops- Casey Brothers, George Coffran, Walter Gaskell, Frank Hillman, Walter Howe, William Kerr and Wilbur King- all with shops on Main Street. 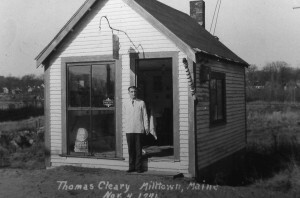 There were three in Milltown Maine- Manley Stanhope, Ed Whitney and George Wilkins. Even as late as 1957 there were 5- Harry Barlow, Casey’s, Wilbur King, Leary’s in Milltown and James Loney. Now barbers are rarer than hair on a billiard ball! (Sorry, I couldn’t resist). In more recent times Louis Morrison practiced the trade in the barbershop at the St. Croix Hotel, Casey’s still flourished and there was Harry Barlow on Winter Street. He was my barber as a kid and I was always fascinated watching Harry shave a customer. The chair would be reclined, Harry would lather the victims face and the straight razor, stropped for good luck a couple times on the leather strap hanging from the barber’s chair, would flash with incredible speed over the customer’s lip, chin and neck. I was sure the blood would soon begin spurting all over the shop. I couldn’t understand how the customer could be so calm as Harry always talked a blue streak the entire time and seem completely distracted from the delicate task at hand- waving his free hand for emphasis and expostulating to the other customers, as only Harry could, on all manner of subjects.His favorite expression was “Mister Man!” as in “And that’s the truth Mister Man!” Harry was very opinionated and as noted by Carol Allen, not great at customer relations. Where ladies had their hair done is somewhat of a mystery. 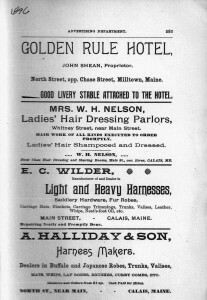 The one early ad we found for Ladies Hairdressing, shown above, was for Mrs W. H. Nelson’s Hair Dressing Parlors on Whitney Street from 1896. 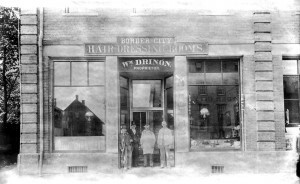 However it appears from the Casey’s barbershop photo above that later a woman hair dresser worked out of a room in the back of Casey’s Barbershop and girls may have gotten their hair cut by the barber. We believe the barbers pictured above are from the front: Jim Casey, Charlie Casey, Jack Casey, fourth unknown. By 1935 ads for Beauty Parlors began to appear in papers and business directories. 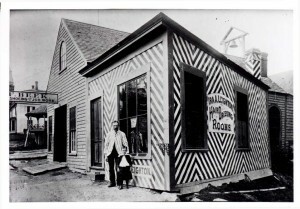 The 1935 Calais Directory lists Charlotte’s Beauty Shop, Margaret Goode and Louise’s Beauty Shoppe. Presently we have one barber in Calais and a beauty shop on every corner. The worm has turned. 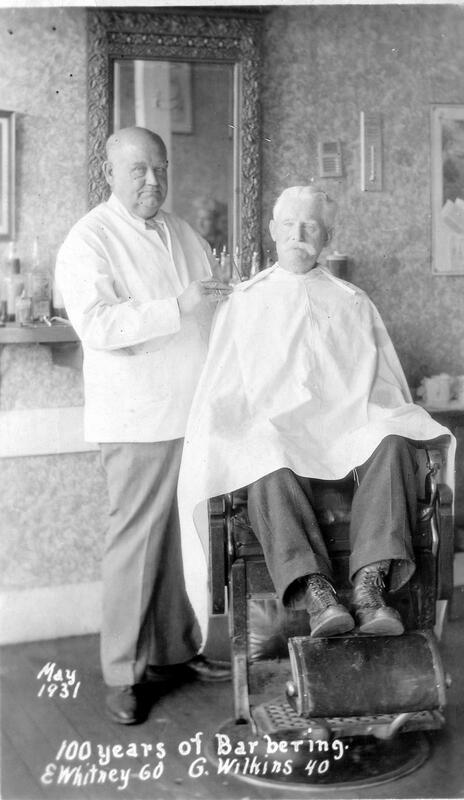 Harry Barlow would have a good deal to say about the present state of barbering and it wouldn’t be pleasant.